Select Option Small 20 - 24 in. Medium 30 - 36 in. Large 36 - 42 in. X Large 42 - 48 in. 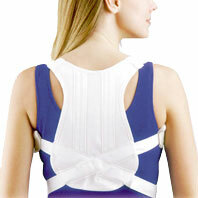 The Posture Shoulder Brace gently keeps the shoulders back for proper posture control. Measure around chest at the base of the sternum. I bought this as a gift for my mother, which had been having intense back pains for months. After she started using the back brace, she started feeling better by the day. Now she can sow and do other activities having the certainty that she will have the right posture. Thank you!